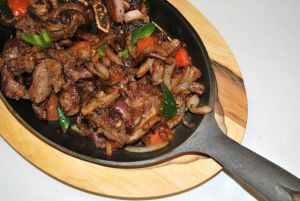 Tibs | Marinated Meat is an Ethiopian food recipe for lamb and beef with peppers and chili. Heat up a deep fry pan and when hot, line the base with oil. Put the lamb ribs (fat side down) in the pan and let them sizzle until deep golden brown with lid on. Add the onions, stir and saute until golden brown with the lid on. Once the onion is browned, add both green and red capsicums and stir for 1 minute. Remove half of the onion and capsicum mix and keep in a separate bowl to make room so the meat can have direct heat. Add the beef and spread it out so that it covers the surface of the fry pan. Season the top layer of the meat with salt, cardamon and fresh chilli and then mix it well and put the lid on. After 3 minutes, stir again and put the lid back on. Once meat is cooked, turn the heat down to a low temperature and add the bowl of onion and capsicum that was previously removed. Finally, add the ghee and mix it together.